The PANDORA Heart Iconic Bracelet Gift Set is the perfect gift to introduce the PANDORA collection to your loved one. This gift set is comprised of a sterling silver PANDORA heart clasp bracelet, two Beveled clips and features a select charm of your choice valued up to $45. Retail value up to $180 - a potential $30 savings over purchasing these items separately! 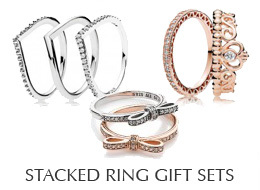 A PANDORA bracelet gift box is included. Gift wrap can be added at check-out. Ships Monday, April 22 if ordered in the next 2 days, 22 hours and 26 minutes! The PANDORA Iconic Bundle Bracelet Gift Set is comprised of a sterling silver PANDORA heart clasp bracelet, two Beveled clips and features a select charm of your choice valued up to $45. Retail value up to $180 - a potential $30 savings over purchasing these items separately! A PANDORA bracelet gift box is included. Gift wrapping can be purchased at check-out.